Zumas, a creative writing professor at PSU, created a ficitonal Oregon atmosphere where abortion is illegal, laws just passed forbidding single parents from adopting, and IVF is banned. Five women navigate their different relationships to womanhood & motherhood. Each woman character is unique, and yet I related with them in profound ways. Red Clocks is an engaging novel; the best I've read in years. The character Gin still lives in my thoughts weeks after putting the book down. Five women. One question. What is a woman for? In this ferociously imaginative novel, abortion is once again illegal in America, in-vitro fertilization is banned, and the Personhood Amendment grants rights of life, liberty, and property to every embryo. In a small Oregon fishing town, five very different women navigate these new barriers alongside age-old questions surrounding motherhood, identity, and freedom. Ro, a single high-school teacher, is trying to have a baby on her own, while also writing a biography of Eivør, a little-known 19th-century female polar explorer. Susan is a frustrated mother of two, trapped in a crumbling marriage. Mattie is the adopted daughter of doting parents and one of Ro's best students, who finds herself pregnant with nowhere to turn. And Gin is the gifted, forest-dwelling herbalist, or "mender," who brings all their fates together when she's arrested and put on trial in a frenzied modern-day witch hunt. RED CLOCKS is at once a riveting drama, whose mysteries unfold with magnetic energy, and a shattering novel of ideas. In the vein of Margaret Atwood and Eileen Myles, Leni Zumas fearlessly explores the contours of female experience, evoking THE HANDMAID'S TALE for a new millennium. This is a story of resilience, transformation, and hope in tumultuous-even frightening-times. Leni Zumas is the author of the story collection Farewell Navigator and the novel The Listeners, which was a finalist for the Oregon Book Award. She is an associate professor in the MFA Program in Creative Writing at Portland State University. "Zumas has written a work that's preoccupied with what it means to live inside a woman's body, and to exist in that body in a world that's long viewed it with fear and unease.... A thoughtful, complicated picture of womanhood-and a fierce argument for individual choice.... Red Clocks is relentlessly interrogative but always humane.... Red Clocks instead is deeply, intentionally personal. Rather than trafficking in sweeping generalizations or one-size-fits-all dictates, it focuses on the uniqueness of all of its characters, who are nevertheless linked by the immutability of their bodies. The familiarity of the book's world, just a step removed from our own reality, is the most shocking thing about it." "A cautionary work of far-sighted fiction.... Spooky-good." "Zumas manages a loose yet consistently engaging tone as she illustrates the extent to which the self-image of modern women is shaped by marriage, career, or motherhood. Dark humor further enhances the novel, making this a thoroughly affecting and memorable political parable." "Zumas' novel is a reckoning, a warning, and nothing short of a miracle. Don't miss it." "Zumas is a lyrical polymath of a writer: she loves wordplay and foreign terms, she has an ear for dialogue, and she knows an impressive amount about herbal healing, Arctic exploration, and the part of the U.S. her story is set in...A good story energized by a timely premise." "Shattering.... With its strong point of view, the novel, in lesser hands, might have been reduced to agitprop, but Zumas has raised it, instead, to the level of literature, which readers will find deeply moving. The characters are beautifully realized, inviting empathy and understanding; the richly realized plot is compulsively readable, and the theme, with its echoes of Margaret Atwood, is never didactic but invites thought and discussion. The result is powerful and timely." "The book has a beautiful literary top over a highly relevant science fiction setting." 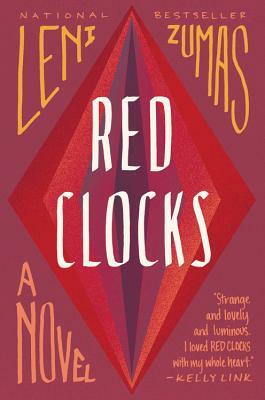 "This is the dystopia that the right wing wants...the characters in Red Clocks are nuanced and funny, and the novel itself is as in-your-face yet strangely beautiful as the cover art." "Zumas' book stands out from the crowd for its thoroughness in revealing the hypocrisy inherent to valuing the lives a woman brings into this world, but not the life of the woman herself." "Like Margaret Atwood in The Handmaid's Tale, Portland author Leni Zumas' new book describes a future both frightening and all too possible....[Zumas]has a lovely way with a sentence and a sharp understanding of how women can be jealous and supportive of each other in equal measure. The coastal setting is vividly rendered, as is the everyday reality of doctor appointments, dirty dishes and broken dreams." "A book as lyrical as it is devastatingly honest, Red Clocks fast-forwards to the time after you've marched and called and voted, showing us all the complexities and pains of life in the aftermath." "The novel takes place in a United States only slightly extrapolated from our current one-and it's through this familiarity that the book derives its power....Zumas's decision to tell the story from four different perspectives is not just a stylistic flourish. Together, they form a raw portrait of the forces of disenfranchisement that women have faced for millennia. What gives Red Clocks its lingering pungency is how, despite each character's distinct circumstances, the same features-pregnancy, motherhood, and social expectations-trap and menace them all.... Luminous." Join us at Chemeketa Community College for the 2019 Terroir Creative Writing Festival on April 20th. This is the 10th Anniversary of the Festival and will feature such literary luminaries as Molly Gloss and Oregon Poet Laureate Kim Stafford. A complete list of authors and workshops, as well as registration information, can be found here.